It hit me recently how little I actually take care of my skin. I have religiously been removing my makeup without fail every night for a number of years now but that’s where my skincare regime ends unless I am feeling particularly fancy or reviewing a new product for the blog. Generally speaking I will grab the micellar water and a few cotton pads, go to town with them and splash on some toner for good measure at the end before collapsing into bed. When I was invited along to a VIP event at The Body Shop for the Bournemouth Bloggers last Sunday, I knew it would be the kick up the bum I needed to take more care with my skincare. Fortunately, we were given free reign of the Bournemouth branch, which is located opposite Build a Bear and just down from Primark in the town centre. The store was opened up after hours exclusively for our group to browse and discuss our skincare needs with members of the team and let me tell you, it was brilliant! Greeted in my favourite way, with a glass of prosecco, we were introduced to the team and then able to explore the store for the rest of the evening. With lovely members of staff providing demos and mini makeovers, as well as being able to provide one on one consultations, it was a lovely, chilled out event and I had so much fun chatting away to everyone whilst shopping and sipping my drink – pretty much a perfect end to the weekend really! As I mentioned, my main concern was my bedtime skincare regime so I focused on finding a must have product to help give my skin the extra TLC it needed. I was introduced to the Oils of Life range and their Intensely Revitalising Oil-in-Gel was suggested to me. I will be giving it a go and will report back! I loved checking out the makeup section, as I haven’t really tried much of the Body Shop’s range before, usually focusing on their skincare when I’ve made previous purchases. There were so many lovely shades of lipsticks to choose from, and I loved their eyeshadows – the pigmentation was brilliant! 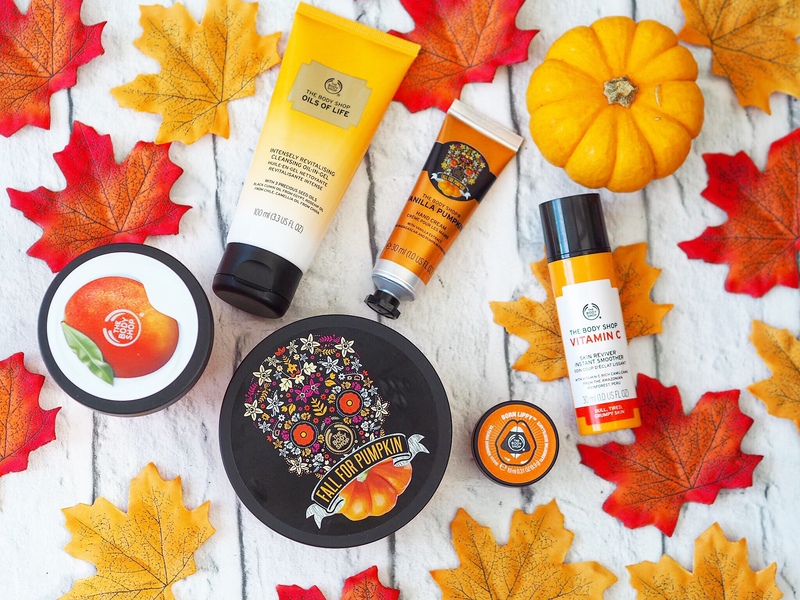 One of my favourite things to do when I am in The Body Shop is to sniff everything in sight and I fell head over heels in love with their seasonal Pumpkin range. The scent reminds me a little of Yankee Candles and cake and I am so here for that! I ended up getting both the body butter and hand cream as it just smelt too incredible to resist. I also picked up the Mango body yogurt, the clementine lip gloss and a cute little strawberry bath bomb as, again, the scents are just divine. With a brimming shopping basket (they provided us with a special discount on the night and oh my word was it dangerous), I managed to resist more skincare and instead opted for a new face powder and brush before heading over to the till and picking up my lovely goody bag, which was full of cute little samples and a full size strawberry scrub, which I cannot wait to try out in the shower! I had such a lovely time at The Body Shop in Bournemouth, it was the perfect Sunday evening catching up with friends and meeting some new bloggers as well. I can’t wait to try out all my new products and I’m sure I will be posting about some of them soon! I was invited along to the Bournemouth branch of The Body Shop with the Bournemouth Bloggers, however all opinions and images are my own (unless otherwise stated).